A Snapchat video was posted Saturday night involving members of the UA Little Rock chapters of Chi Omega and Pi Kappa Alpha rapping along to a hit song that contained some potentially offensive lyrics. The song in question is “Freaky Friday” by rapper Lil Dicky featuring Chris Brown, which is currently in the Top 10 on the Billboard Hot 100 Chart and contains what some may consider “racially insensitive” lyrics. Despite Lil Dicky himself being white, the majority of the people concerned about the video are more upset over the students rapping along to the lyrics, who the majority appear to also be white. Good morning everyone. If you don't know already, Paige and I lost the runnoff election last night. I would to thanks all of my true supporters and friends for supporting Paige and I through all of this. I am very grateful that I can honestly say that all of my brothers stood by me throughout this whole time, and that's all I have to say about the election. Now, let's get to this video. This video, is atrocious. Am I appalled that this happened at UALR? NOT AT ALL. However I'm surprised that these people, members of the ΠΚΑ Fraternity and ΧΩ Sorority were stupid enough to record themselves saying what they said. I hope all of you who attend UALR, who work at UALR, are happy because the President Elect and Vice President Elect of the Student Government Association, are members of the two organizations that were caught in the video. This is who you all voted for. I've had several people (white people might I add) already tell me to pipe down, to not play into this. And it's not been the first time I've been told to pipe down on racial injustices at UALR, either. Well you know what? I have about HAD IT WITH PIPING DOWN!! I will longer allow people to silence me about racial injustices, and I will not let this video get swept under the rug as if it didn't happen or like it's ok for white people to use such foul and derogatory language. This is unacceptable, and more should be done about the people involved in the video as well as the organizations involved in the video. Wheeler released a statement condemning the acts of his fraternity by saying “the language was inappropriate, disrespectful and not acceptable of students. It reflects poorly on not only the students involved but the university and campus community.” Wheeler also stated that UA Little Rock SGA and IFC are now planning an education seminar on race and ethnicity for the fall semester. 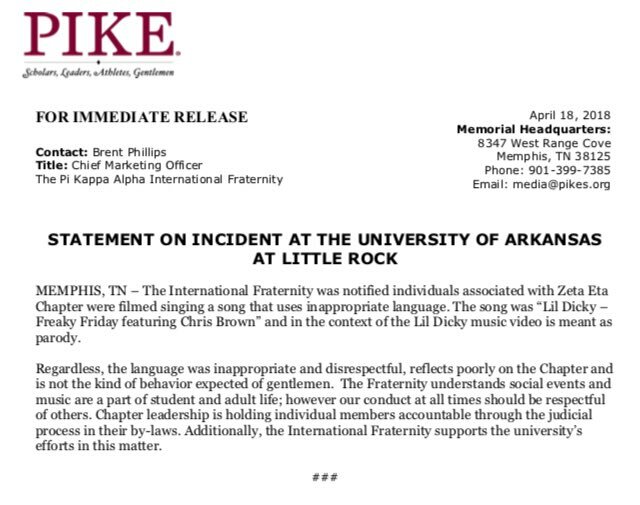 Phillips continued in his statement by praising UA Little Rock’s way of handling the controversial matter. In a press release, Chancellor Andrew Rogerson said that UA Little Rock took immediate steps to investigate the incident and that they are reviewing the behavior of the students for any possible violations in relation to the university’s Code of Student Conduct. If found, Rogerson says that they will take the appropriate steps highlighted in the student handbook. In the meantime, Rogerson says that the two organizations are restricted from participating in any campus programs and activities. Members of the student body of UA Little Rock have all reacted differently towards the situation, with some seeing and some not seeing a problem with the students in the video. There will be a seminar Friday, April 20, from 9 am to 12 pm in the Ottenheimer Library for students to openly speak with campus representatives about their concerns.